He's a rapper from East Harlem, she's a retiree in Florida, and now they are IRL friends. Spencer Sleyon is a 22-year-old rapper and producer. He just moved to New York a few months ago from Silver Spring, Maryland, to pursue his dreams of a music career. Last year, Spencer began playing the app Words With Friends. 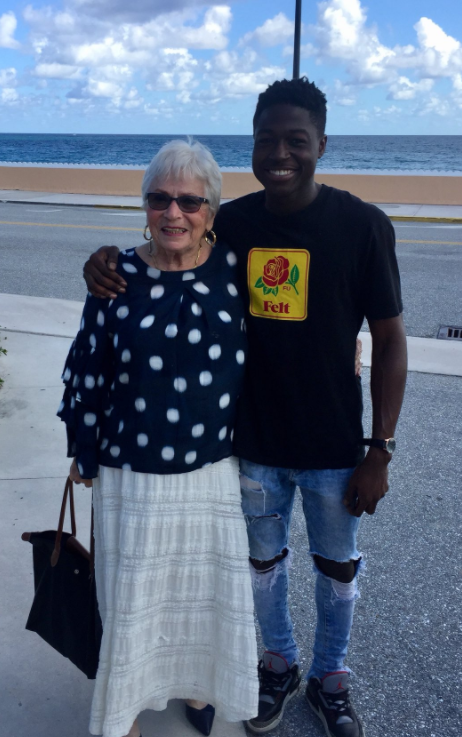 Around July, he hit the game's "random" game option, and connected with an 81-year-old woman in Florida named Rosalind, nicknamed Roz. Spencer told BuzzFeed News he "only played the game when [he] was bored." However, he soon developed quite a rivalry with Roz. They would play multiple games at a time and began to chat in the app. "I was only playing those games with Rosalind," he said. "Eventually, we would just start chatting about current events in 2016." In one of their conversations, Spencer mentioned to Roz that he was considering moving to New York to pursue his dreams of a rap career. She encouraged him to go after it, he said. "Whatever you want, just go grab it," he said she told him. Her words stuck with him. However, around December, Spencer grew too busy with life and deleted the game. He moved to NYC and reconnected with an old high school friend, named Hannah. One day, he was at Hannah's house and he began discussing his friendship with Roz. Hannah's mom, Rev. Amy Butler, heard the conversation and was immediately intrigued. Butler, the senior minister of the Riverside Church in Manhattan, told BuzzFeed News she was taken by his story. She said her ministry focuses on creating connections with people, and she had an idea. "[I thought] it would be really cool to close the circle and arrange for them to meet in person," she said. Spencer agreed, and downloaded the app again to reconnect with his pal. So, Butler made it happen. She connected with Roz, and flew down with Spencer to meet Roz in Florida. As you can see, they were super happy to meet in person. "It was actually awesome, it didn't feel like I was meeting her for the first time," Spencer said. The pals chatted and got to know each other better. Butler said Roz even booked them a special table at a restaurant for their hangout. "She had chosen the table so Spencer could see the ocean," Butler said. 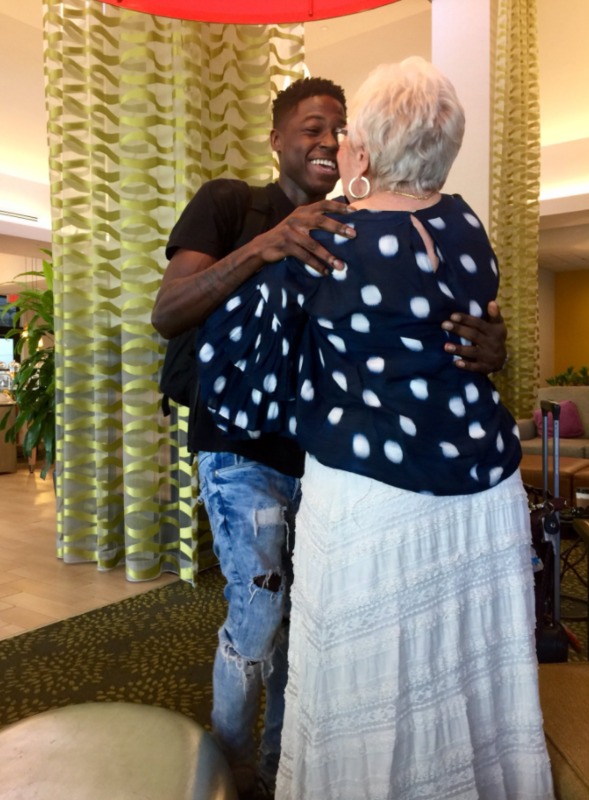 Butler said she asked Roz why she decided to meet them — and she had a great answer. "You know life is all about taking chances, Spencer felt like a friend to me," she said Roz told her. Spencer said he hadn't told a lot of people he was going to Florida because it was a long story. So, he decided to share it on Twitter with all of his followers. People fell in love with the story, and it went insanely viral. Spencer said all the attention has been crazy. "I didn't expect for any of this to happen," he said. Butler said she thinks the story has resonated because "all of us are longing for connection with each other and hope in these very fearful times." "My work is about building community that brings people together, and in our current political climate, I am working against the tide," she said. "I consider this an extension of my work." And if you're wondering, Spencer said he was the clear winner of the rivalry. And he has the RECEIPTS!